Potato salad flavors, but with a twist. You could certainly play with a variety of herbs and spices in this recipe. This is good barbecue food. Bring 3 cups of water to a boil in a small pot. Sort, rinse, and drain the lentils and add them to the boiling water. Simmer for about 8-10 minutes, until tender. They will break apart a bit while cooking, but this lends a creamier texture to the salad which is really nice. Drain the lentils and set aside to cool. Steam or boil the cauliflower spears until fork tender. Drain and rinse under cold running water until cool. 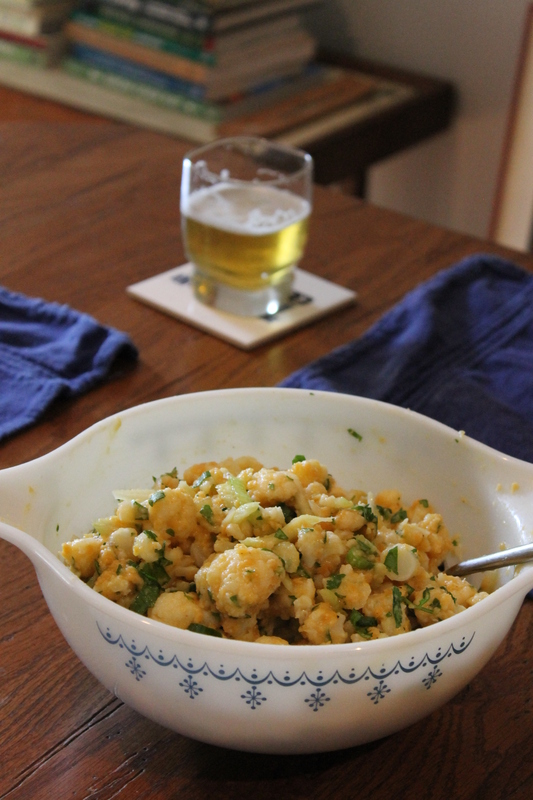 Cut the cooked cauliflower spears, florets and stems, into smaller pieces and place in a large bowl with the cooked lentils, celery, onion, cilantro, lemon zest, lemon juice, olive oil, salt, and pepper. Toss until well combined. Let sit for at least 30 minutes to let the flavors deepen before serving. This sounds delicious! Hoping to try it out soon.